Join Us For Another Toast to Trost! 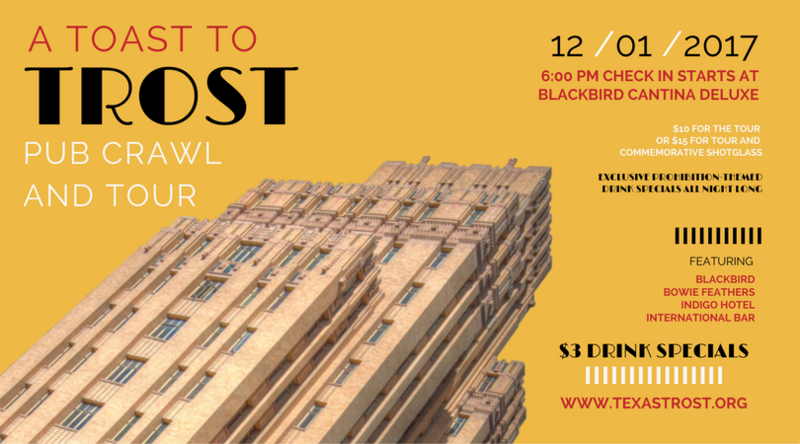 Join the Texas Trost Society for another round of our favorite downtown tour, “A Toast to Trost”! This 21+ tour takes us to four downtown bars – all in historic buildings – while Malissa Arras, Executive Director of the Trost Society, gives our group a history of downtown El Paso! We begin at Blackbird Cantina Deluxe at 6:00 PM sharp to check everyone in and make sure our mustaches are attached and end at International Bar with a pub quiz, 1920’s and 30’s costumes and accents are strongly encouraged! $10 gets you the tour, exclusive drink and food specials, and a stick-on mustache to rock while learning about historic buildings. Sign up for the tour TODAY!